Nike Tiempo Air Legend II – The football boot of choice for Joe Cole, Cesc Fabregas, and Carlos Tevez. In 1971, Nike created its first football boot prototype. However it was not until 1994 that the football boot brand made its first move into the world’s most popular sport. The final of the 1994 World Cup, held in the USA, saw 10 of the players on the pitch, including Brazil’s Romario and Italy’s Paolo Maldini, wear the Nike Tiempo. 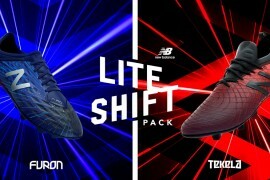 The Nike Tiempo II is the updated version of the Nike Air Legend football boot and will be worn by the likes of Joe Cole, Cesc Fabregas, Andrea Pirlo, and Carlos Tevez. 15 grams lighter than the Nike Air Legend, the Nike Tiempo II weighs in at 315 grams. The design aims for the new Nike Tiempo II were to re-engineer the upper and heel counter, decreasing the tongue size, to reduce the overall weight of the football boot, whilst ensuring a comfortable fit and improved performance. The new Tiempo Air Legend II has an all over soft kangaroo leather upper for superior comfort and ball feel with the updated pattern design from the previous model giving a pro fit. The fold over tongue is designed to give a smoother ball-striking surface. The high performance midsole features a moulded sockliner with a re-engineered Zoom Air heel unit providing responsive cushioning and reinforced protection in the tackle. The lightweight TPU outsole has a glass fibre shank and toe for lightweight support and stability, with forefoot flex grooves providing added flexibility. A combination of traditional conical and bladed studs allow the player to benefit from a 360 degree grip for optimal traction and pressure dispersion. The lightweight Nike Tiempo II is available in a soft and firm ground option and retails at a price of £84.99. Loading... Tell us what you think of the Tiempo Air Legend II football boots. awful in the wet and mine fell apart after 2 months. The whole heel has come away. Now own Pantofola d’oro. different class. Look them up. they should make the studs shorter because when i had them and i did a roulette the ball always slipped away. everything else is really good though. I have had a pair of these for the last three years and they are great. They are a perfect blend between speed and durability and work well for ball control, especially when you are playing in wet conditions. Vapours don’t hold up well in these conditions but the Air Legends do! 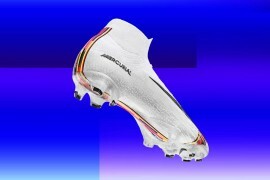 i llloooovveeeeee da brazilain ronaldo if he wears these they must be good!!! hes thebest player ever!!! rrrrrrrrooooooooooonnnnnnnnaaaaaaaaaaaaallllllllllllllddddddddddddoooooooooo!!!!!!!!!!!!!!!! Where can i buy these? ive been looking everywhere but i cant find them!! i need i size 7 in firm ground! please help me find a pair! Same here. I’m looking for a size 10 in firm gorund please. I found a website for you that has them in black/sail for size 7.
ive just bought some of these’s in black and there very good boots. i recomend you buy these!!! Do you have a white one in size 8? where do you go to buy them?? is there a store in Chicago U can buy theÂ Nike air legend II FG? where cann i get these?, best boots i ever had! Any idea if these boots are still available? where i can buy ????????????? !!!!!!!! !